Songs Earlier this week, I got stuck in traffic on my way to work during a snowstorm. 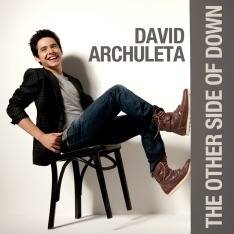 While sitting in that traffic, I was listening to a CD I had made of David Archuleta’s early performances when he was a contestant on American Idol’s season 7. As I inched my way down the road to start my work day, I was feeling tense and very stressed. I was literally going no where in a line of traffic and my frustration level was starting to peak. But then, a song started playing and my attention turned to the beautiful voice that was singing. The tone and sound of David’s voice was soothing and I became focused on that and not the traffic ahead of me. He was singing a song that he had performed during one of the ‘mentor’ weeks on American Idol. I recalled that when David sang this song for the star who was mentoring on Idol, he made her cry. She too felt the emotion as he sang her song. The way David is able to interpret a song is pure magic. He pulls the listener in and he sings from his heart, so you feel the song with him. This is what was happening to me on that long morning commute to work. “Smokey Mountain Memories” was written by Dolly Parton and recorded during a concert at Parton’s theme park Dollywood, for her album Heartsongs: Live from Home. It was released in September 1994 by Columbia Records. The song “Smokey Mountain Memories” is about following a dream to a better life, but never forgetting those you left. It speaks of staying strong and holding firmly to your faith, as you struggle to make it in a new life far from home. I think David really related to this song during his time on American Idol. He spent many months away from his family and friends in Utah while he competed on the show, so when he sang the song, his emotion really came through! “Smokey Mtn. Memories” always one of my favs. So heartfelt and those high notes were awesome! I think David surpassed himself on this one.